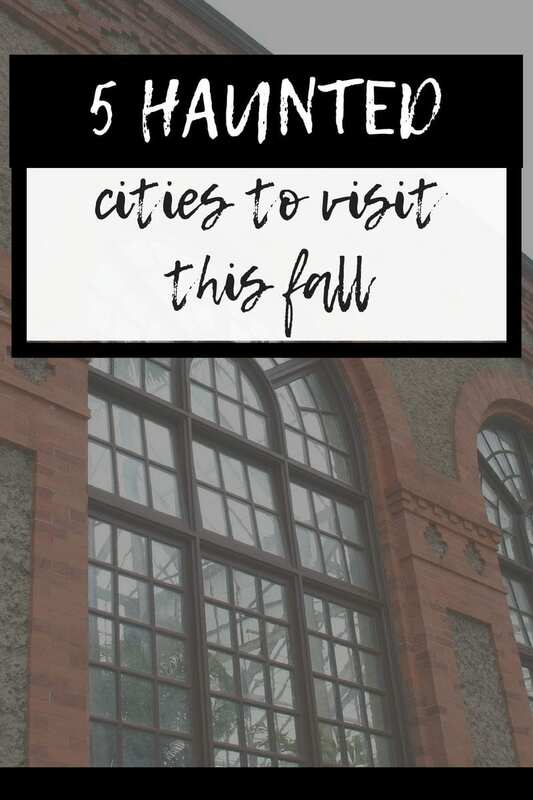 I’ve always wanted to go on a ghost tour, so I’m sharing five haunted cities to visit this Fall. 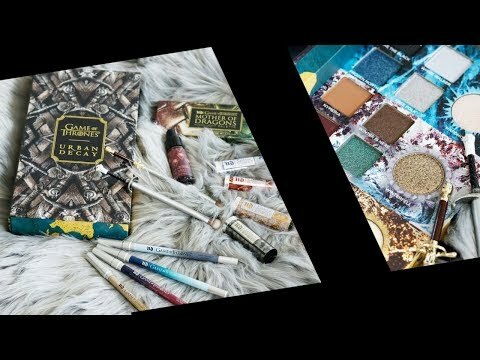 The Fall is the perfect time to indulge in everything this season has to offer, from pumpkin spice lattes and warm, cozy sweaters to scary stories and haunted houses. If you’re searching for a fun fall getaway, the South is the place to go for a scary trip. Whether you’re looking for haunts rooted in history or just a landmark with a spooky backstory, you can’t go wrong with these five haunted cities to visit this Fall. 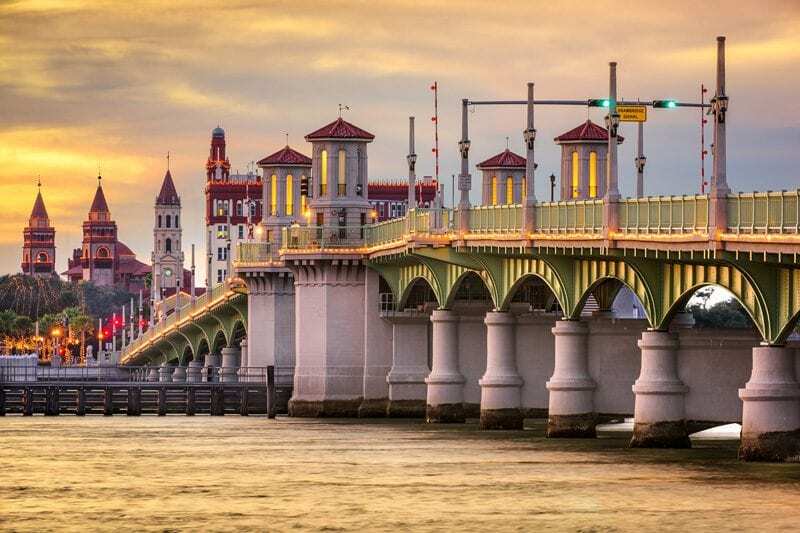 As the oldest city in the country, St. Augustine is ripe with history – and hauntings – making it one of the best haunted cities in the United States. This old city is filled with creepy places to visit to get your thrills. Start your haunted tour at the old jail, an iconic building built in 1891. In this creepy tour, you’ll see a collection of deadly weapons used in actual crimes, visit the jail’s death row cells, and hear stories of hangings inside the iron bars of the jail cells. Many visitors and employees of the historic museum have reported feeling cold spots and hearing strange sounds in the building. Some even believe one of the city’s sheriffs haunts the main cell block. Continue your paranormal tour of the city at the historic lighthouse, which has a tragic history in its own rite. Whether you’re searching for the ghost of Joseph Andreu, the original lighthouse keeper who fell to his death while painting the tower, or of the two young girls who drowned when they slid down the hill into the bay, you’re sure to find something spooky at this spot. Finish your scary tour at the Spanish Military Hospital, where visitors have reported a variety of paranormal events, like beds sliding across the floor, the smell of sulfur, and unexplained moans and groans throughout the building. As a working hospital through several wars, this historic building saw many sick and injured people pass through its doors. Some say the souls of those who died there are stuck within the walls forever. St. Augustine really is a cool place to visit! I’ve been there twice. Another of the haunted cities in Florida filled with rich history, Key West is also a hotbed of paranormal activity. There are a variety of interesting points of interest for travelers searching for a thrill on this tropical oasis. Start your haunted tour of the island at the East Martello Fort, which was built in the 1860s to protect the city from the confederacy. Since no battles where ever fought in Key West, the fort is known for something creepier than ghosts of Civil War soldiers – a doll. The fort’s museum is home to Robert the doll, a creepy handmade construct of artist Gene Otto. It’s said that this eerie doll is possessed, either by Voodoo or a curse. To totally immerse yourself in the paranormal, consider a stay at Marrero’s Guest Mansion, a charming bed and breakfast with a tragic history. The home, built by cigar maker Francisco Marrero, is said to be haunted by Marrero’s first wife, Enriquetta. Named the most haunted street in the city, visitors to Key West hoping to get a fright should definitely visit Eaton Street. Said to be home to a restless sea captain who haunts the cemetery behind St. Paul’s Church, as well as a spooky doctor who practiced on the street, and ghosts of the former Masonic Scottish Rite Temple, Eaton Street is a great place to see a ton of scary Key West History all at once. To really get a feel for the street, travelers need to check out the church, the Old Town Manor, and the Artist House. I personally love Key West! I’ve only been there once for a friend’s wedding and we stayed at a cute little bed and breakfast near the beach. I want to take my parents down to the Keys when they next come to visit. 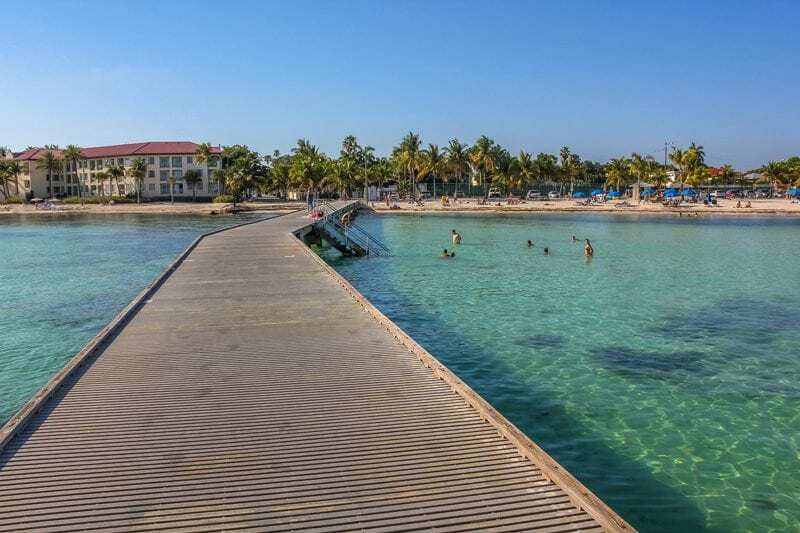 It’s hard to beat the ‘Island Time’ feel of Key West. It’s the only place, outside of Maui Hawaii, that I’ve experienced that ‘Island Time’ feeling. The city famous for its music is also known for something a little more sinister – its ghosts. 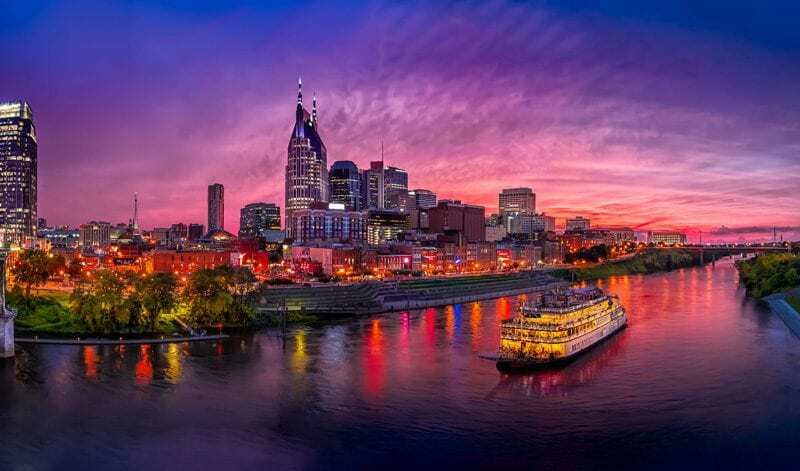 Nashville, also known as the Music City, has several haunted locations for visitors hoping to find a poltergeist on their next vacation. Start at the Ryman Auditorium, where staff and performers have reported a shadowy figure of a man in the balcony. Some even say it may be the ghost of country music legend Hank Williams Sr. wandering the auditorium’s halls. The home of America’s seventh president, Andrew Jackson, is also said to be haunted. Several visitors to the historic home have reported seeing a ghostly apparition that seems to fit Jackson’s description roaming the halls of the landmark. One of Nashville’s most well-known haunted spots is actually outside the city. The Bell Witch Cave, located in Adams, is a must-see for visitors to the area. With a story involving a land dispute, a practicing witch, and an oath to haunt the land for eternity, the cave and the land where it is located has a history of scary activity. While the haunted farm has since been demolished, the cave is said to be filled with strange activity like rattling chains and loud knocking sounds coming from within. I used to live in Memphis, Tennessee and I’ve driven through Nashville more times than I can count! I want to stop at the Bell Witch Cave next time I’m in the area. This city by the sea may seem like a quaint oceanside town during the day, but at night, it turns into one of the spooky haunted cities filled with ghostly activity. One of the most popular haunted spots in Wilmington is the USS North Carolina, where a soldier was who died during a torpedo strike haunts the large battleship. Visitors and staff have also reported seeing ghostly figures in the ship’s passageways and portholes. Several residences in the city are also known to be haunted. The Latimer House, a Victorian home built in the 1800s, is said to be home to the ghosts of the Latimer’s children, five of whom died before the age of 5. Passersby heard strange sounds coming from the home and seen faces in the windows. The Bellamy Mansion, which was built in the late 1800s by slaves, is said to be haunted by the former slaves who lived there. The Price House is another creepy home in Wilmington that is said to have been haunted since its construction, as it was built on grounds that were once used for gallows and executions. 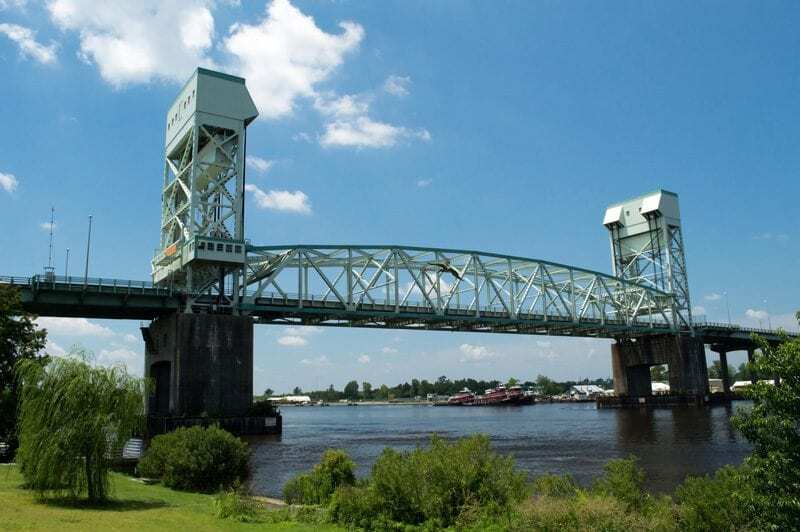 I’ve never been to Wilmington, but it has been recommended to me as a good place to visit. Nestled in the Appalachian Mountains, this picturesque city is a hotbed of paranormal activity. Start your ghostly tour of Asheville at the city’s most famous landmark, the Biltmore Estate. This beautiful mansion was home to George Vanderbilt, who remains in his home to haunt visitors to this day. Visitors also report seeing a headless cat meandering around the property, as well as hearing hushed whispers in the library and laughter from the swimming pool. Built from boulders dug from a nearby mountain, Grove Park Inn is a popular destination for visitors to the city. It is also said to be haunted by the Pink Lady, who fell to her death in the hotel’s atrium and enjoys playing pranks on guests staying in room 454. I’ve been to Asheville once, when we went on our ‘Cabin in the Woods’ vacation with our best friends in 2015. We loved it and want to go back! If you were planning a haunted cities trip in the Southeast, where would you go? Do you enjoy visiting historical landmarks? Ohh that’s so awesome! 3 were already on my list to visit!